Wholesale Custom Electric Car Mugs -Coffee Warmers Personalized or Blank. INexpensive, Promotional. Budget Prices in the USA and Canada. Special Overstock Sale! This personalized electric mug or coffee warmer mug is an unique gift idea. It will keep your coffee, tea or soup warm for hours during long trips! 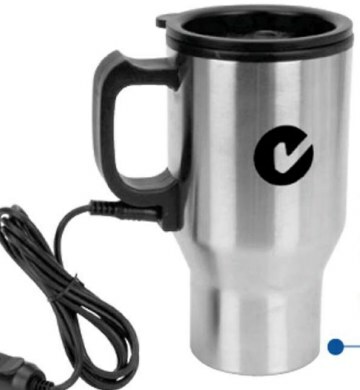 The bulk electric car mug is a car stainless steel mug with double wall insulation and electric heating. Car lighter adapter included. Automatic shut-off at about 78 deg. F. Free artwork design. Lowest prices in USA and Canada for wholesale personalized electric car mugs. American clients pay no taxes. Basic unit prices below include your for your 1-color imprint. Contact us for the pracing of blank (not custom imprinted) electric car mugs. Estimated Production: 7-10 days after art approval; please contact us for faster delivery; Blank (not custom imprinted) elecctric car mugs ship next day. Material: Stainless Steel with Plastic lining. Electric Heating with Automatic Shut-Off. Car Lighter Adapter - 12VDC. Imprint Size: 2" x 2.5"
Packaging: individual white box; 24 units per casrton of 20 lbs.